Your Guide To Portugal: We offer our assessment of the three terrific golfing areas in this alluring Iberian country. One country. Three areas. One of them you will know lots about, another you may have heard a bit about. The third will for many of you be filed under 'undiscovered'. Taken together, few, if any, areas in Europe can match what the Algarve, Lisbon and Porto can offer. All three are especially well equipped to satisfy the needs of golfers. The fact the game is barely played at local level, means the clubs and courses are almost exclusively for visitors' use. So Portuguese venues simply have to provide quality, because the competition is so high. And as well as traditional rival Spain, Portugal now has destinations as diverse as Bulgaria and Abu Dhabi to contend with. As well as its courses, the country can also offer pool time, beach and water sports, or day trips to heritage sites, water parks or bustling city centres. Vidago Palace opened in 1910 and over 100 years later still maintains the same splendour, service and conviviality for which it was immediately known. Having charmed generations of travellers, it was reborn in 2010, being totally remodelled yet preserving the architectural heritage of the buildings. It is, once again, confirmed as a benchmark among the best historic hotels of Europe. It is impressive at every turn, from the 70 rooms and suites to the Thermal Spa with 20 treatment rooms, and the 18-hole golf course to the six restaurants and bars. Located about one hour from Oporto and 15 minutes from Chaves, it has been classified as one of the Leading Hotels of The World. Its original nine-hole course by Mackenzie Ross has been extended sympathetically too. And if you visit Porto, also make sure you play Estella, a proper links with outstanding Atlantic views. The Gleneagles of Portugal? Vidago Palace. Lisbon has been steadily growing its reputation in the past few years... and that took an enormous leap in 2017 when one of the nest courses to be built in Continental Europe in the past 25 years opened. West Cliffs entered Golf World's Continental Top 100 at No.25 in 2017 – a sensational position in anybody's language... yet it deserved every last place of it. This Cynthia Dye design is part of the Praia D'El Rey resort – itself one of Europe's nest – and is an instant classic, mixing breathtaking Atlantic views with architectural merit. It has lifted the Obidos region – the beautiful Silver Coast – onto a new level. It already boasted PDR, as aesthetically pleasing a course as almost any in Europe, which has its best holes along the Atlantic, before wandering inland among pine trees. There is also Seve's course Royal Obidos – which opened in 2012 – and exudes class with a mix of cute short par 4s with stellar, exacting 5s. Bom Successo is a Donald Steel design with a solid back nine in particular. In the area around Cascais to the west of Lisbon, Oitavos Dunes is the star and a genuine links experience. It has a chic hotel on site too. Next door is Quinta da Marinha, one of the best spots in Europe for a play-and-stay break while Penha Longa is spectacular and tough in equal measure. 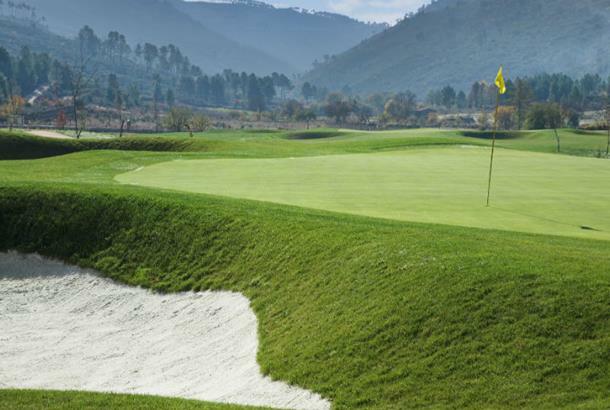 To the south, Troia, a RTJ track, is however the highlight of this area while the Orizonte group boasts Quinta do Peru, two 18-hole courses at Ribagolfe, Santo Estevao and Aroeira; top quality at bargain prices. Europe's most famous area spans the width of Portugal's south coast and is one of the nest stretches of golf anywhere on the planet. Central Algarve has most of the big names, ranging from Quinta do Lago's trio to Amendoeira's duo, and the pair at Vale do Lobo to San Lorenzo. The latter has long been ranked as one of the nest in Europe and has a magnificent seaside stretch in the middle of the front nine. Combine a game here with a stay at the recently renovated Dona Filipa hotel in Quinta do Lago. Penina is where it all began and is a super resort. In the west, Palmares now has three expertly redesigned loops of three while Boavista is amazing value. In the lower-proFIle and less populated east, Monte Rei is the star attraction and is now widely ranked as Portugal's No.1. There are lesser-known 'gems' too, with the Quinta da Ria resort falling into the 'quietly excellent' portfolio. The Climate: Exceptionally good. Porto, relatively, is the least good but it is still excellent, with warmth May to October. Lisbon is next, with even April often very nice while the Algarve is majestic year-round. Getting There: You can y to Faro or Lisbon with all the budget airlines from myriad airports in the British Isles. This is a huge advantage of Portuguese golf breaks – getting there is just so easy and inexpensive. Short game special issue now on sale! Golf World Masters Preview Now On Sale!